Kitchen worktops perform perhaps one of the most important functions in the modern kitchen and without doubt, have to be able to withstand some of the toughest wear. That’s why picking the right work surfaces is vital when designing and buying a new kitchen for your home. And when it comes to kitchen worktops Leicester based Dewhirst Kitchens have a whole variety to choose from. A necessary first step in kitchen design is always to ask yourself what’s important – is it space, look and feel or practicality that you need? What do you use your kitchen for most? Is it to socialise in, cook up culinary masterpieces, or just a place to get the family fed when time is tight in your busy schedule? Kitchen worktops can be used for a whole range of purposes, from food prep, to a temporary shopping list writing space, or football boot cleaning area, so it’s important that they are hard wearing, easy to clean and attractive. Once you’ve identified the purpose of your kitchen (and of course your budget), this is when it becomes time to decide which style suits you best – and kitchen worktops and surfaces are a big factor in the overall decision. Here at Dewhirst Kitchens, we offer the best kitchen designers and installation service for kitchens and worktops. A premium, reliable service that is still affordable. This is why we are the suppliers of choice for a wide range of quality, stylish kitchen worktops in Leicester. Ensuring your worktop is suitable for your kitchen requirements is of the utmost importance, as is finding a worktop to suit your style. Our team can take care of all aspects of design and installation and can also help and advise with regard to maintenance of all specialist products. Dekton and Neolith are two ultra compact surfaces which could be ideal for your next kitchen. They are made using a high tech process to look like natural stone that has been formed through thousands of years worth of pressure and high temperature. This combined with their scratch resistance, and easy to clean properties makes them definitely worth considering. Our Corian Kitchen Worktops are a massively popular choice in a number of designs, for a whole host of reasons. Offering a perfect solution for anyone looking for a unique and stylish look, they can be engraved, carved, routed, worked and come in over 100 colours. Their proven and trusted track record means you can rest assured of long lasting durability. And thanks to their thermoformable nature (easily shaped using heat and pressure) they can be designed and created in an almost unlimited range of ways, depending on your individual needs. Not only this, they’re incredibly easy to clean, which is why they’re not only used in homes, but also in public bathrooms, hospitals and laboratories. One of the most durable, hard wearing worktops you can buy. The quartz are highly resistant to acid, high impacts, scratches, chips, and heat. 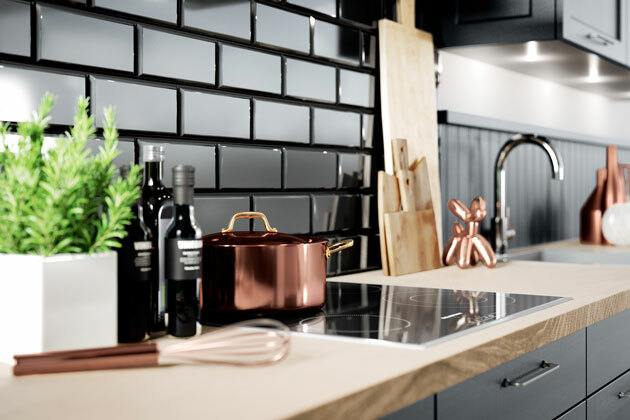 All these properties combined with the stylish look of Quartz has seen their popularity increase dramatically over the last 50 years and establish itself as one of the leading worktop choices. Unlike other natural stones, it is easy to maintain thanks to never needing to be re-sealed. The granite kitchen worktops from Dewhirst Kitchens are sourced worldwide. We have a strong relationship with all our granite suppliers and like to support local, national and international granite traders, while ensuring their products are of the highest quality. Just a few of the great things about granite worktops are the timeless elegance and luxury that is part of their very nature. And, on the more practical side, they’re highly scratch and stain resistant, easy to clean, come in a variety of colours and are much more affordable these days, thanks to the greater availability of raw materials. Our laminate kitchen worktops are one of the best options when it comes to designing your next kitchen thanks to the number of different styles available. With factory fabricated mitred cuts, PVC edging and new textures and patterns, laminates are no longer the poor man’s granite! One of the best things about laminate worktops is that they are incredibly low maintenance, which makes them perfect for someone with a busy lifestyle. Just a simple wipe keeps them nice and clean and their variety of stunning effects include the popular styles of marble and wood. We have a showroom on Granby Street in Leicester with three floors dedicated to showing both traditional, and contemporary kitchen designs. It’s the perfect place to see what you want incorporated into your next kitchen, and to ask any questions to our staff! We even offer a design consultation to discuss every detail. There are also plenty of other blog posts on our website dedicated to a range of topics from things to consider when planning an apartment kitchen, to our recent announcement about becoming a Small Business Sunday winner near the end of last year! Only settle for the very best when it comes to your kitchen work surfaces.